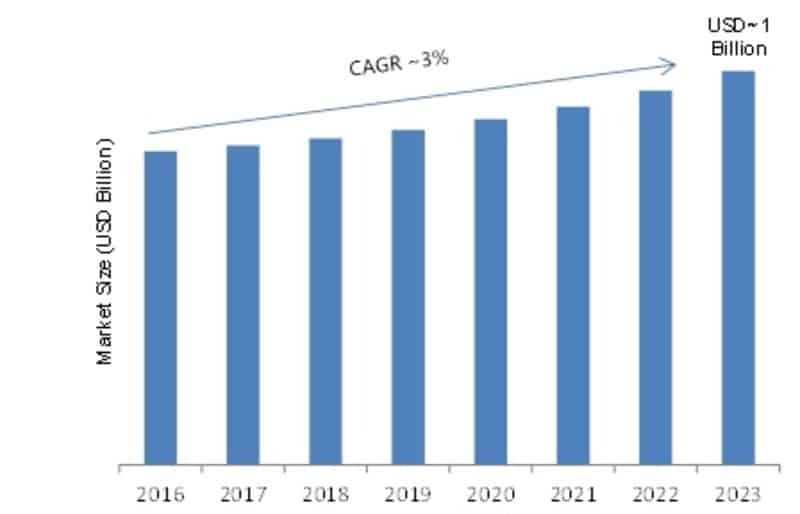 While you are looking for a Multimeter, let we tell you the digital multimeters will be a billion dollar market by 2023 according to reuters. With 3% CAGR, its clearly visible how much popularity it’s gaining. No doubt, A multimeter is an essential & pretty straight forward tool for electricians. However, with a poor financial decision, you can land up getting an unsafe digital multimeter. For example, you have 2 Digital multimeters & both provide the same levels of accuracy; which one to buy? The one which provides maximum safety. Nobody wants an arc flash or shock while working with a digital multimeter. So, all I want to say -always buy a better digital multimeter & in this topic, we will provide you with the list of best multimeters available in the market. The comparison will be unbiased and feature specific. Also, read the individual multimeter reviews. I’m sure it will be helpful for amateurs or DIY electricians who are facing troubles at home or workshop. I have listed a few points on the basis of Resistance, Voltage, Warranty, and Capacitance to consider before buying. Now, It would be unfair not to list out a few other features of the multimeters. So, read on and find out the one that suits you best. 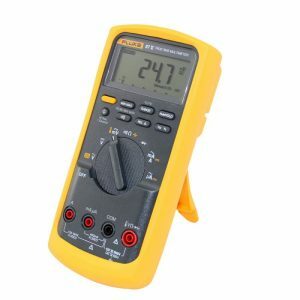 Fluke 117 is the best digital multimeter we have listed. The built-in non-contact voltage detection along with the Loz/AutoV function that helps in preventing false readings. It’s the most accurate multimeter, making it ideal for usage. The compact design that allows easy handling and the magnetic hanger will allow hands-free operation. And that’s not all; it can work on AutoVolt allowing both AC/DC currents and avoids all sorts of false readings. The Fluke 117 is equipped with a white LED backlight allowing work in poorly lit areas. Well, if you are wondering about the safety, worry not, it is rated as CAT III 600 V.
The True RMS Meter, implying that even during erratic sine wave and square wave conditions it can measure accurate readings for you. If you are still looking for more, you won’t be disappointed because the list of features does not end here. It is built from sturdy and high-quality material, ensuring no slouching. The design is so efficient that the dial can be operated from your left hand as well. While its price is $101, I have placed this under $100 multimeters (Don’t worry, you can spend extra $1). It is a hand-held and auto-testing multimeter that performs diode and audible continuity tests. The dual thermocouples easily allow differential temperature measurement. What makes it so unique is the fact that it can measure almost all important ranges accurately, which includes micro-amps used for gauging flame sensors. The best part is its accuracy level and functionality, which is generally not found in any of the multitesters of the same range. It consists of two inputs, which comes with the two thermocouples included in it. Naturally, the screen depicts two separate sets of measurements; making it very easy to monitor both the high and low temperature of the lines. What’s even more special about the tool is that it can freeze the value of a current surge or voltage, while MAX/MIN stores both the high and low readings. The dual screen can even help one compare the current value with one stored in the past. It surely comes with an impeccable display, far better than many others. The bar graph responds very quickly and can instantly pick the noisy signals for you making the work super efficient for you. In addition to it, it possesses well-engineered dials, jack sockets, and buttons and even a kickstand that is built into the top of the lid of the battery compartment. 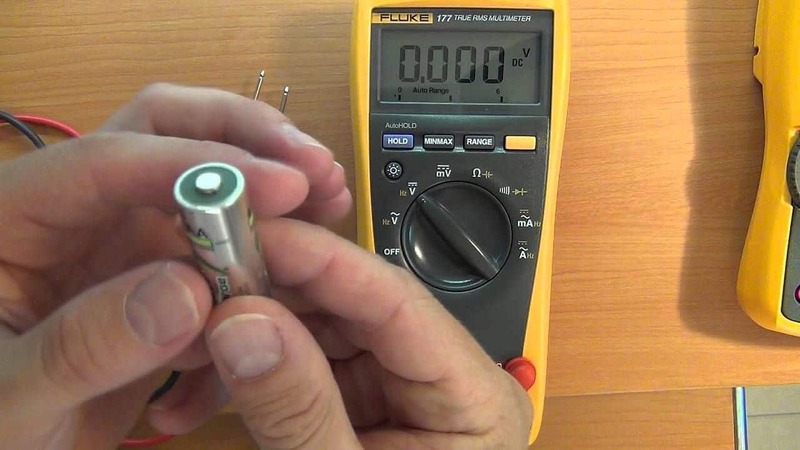 The Fluke 87-V is the ideal multimeter to use in situations where accuracy is a must. 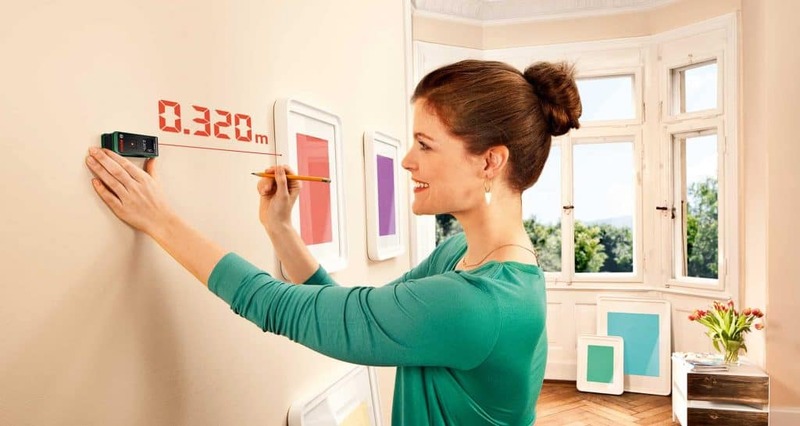 It has a built-in thermometer along with other selection of features. The built-in ammeter is capable of measuring 10A or 20A for up to 30 seconds. The Fluke 87-V uses True RMS AC voltage and current which allows it to give accurate measurements in non-linear environments. Continuing with the technical specifications, the Fluke 87-V can measure frequency up to the range of 200 kHz. The device can also be used for continuity, resistance, or diode tests. In ammeter mode, the device can measure DC current with 0.05% error accuracy. This is majorly why you can rely on this device to get accurate readings. It comes with two-digit modes – 3-3/4 and 4-1/2. The former digit code can get accurate measurements up to 6000 counts. The 4-1/2 mode is capable of taking precise readings up to 20,000 counts. If you’re worried about the safety aspect, you can put your worries to rest. The Fluke 87-V is tested and certified for usage in CAT IV 600V and CAT III 1000V environments. If you’re worried about the longevity of the device, you need not to do so. That’s because of the 87-V ships with a lifetime warranty. Along with the advanced technical features, it’s equipped with a bright display that is lit with two-level backlight. Moreover, you can find additional data hold feature in this. It’s the best automotive multimeter. 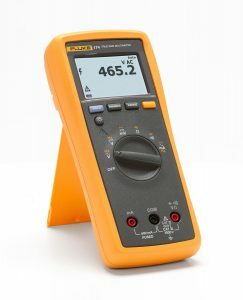 Fluke 174 is capable enough to read AC/DC currents of up to 1,000 volts, making it the right fit for professional use. It can easily test the diodes, continuity, capacitance, resistance, and frequency with both minimum and maximum setting for recording. It is a safe and secure tool, with the category III of safety rating and can easily take 1000 volts, whereas the category IV rating will only take 600 volts. What makes it different is the durability of this tool, it is made up of high-quality material and hence has a tough exterior, capable enough to handle the wear and tear on the job. This one comes with a carrying case and spare cables, making it very handy and easy to port. Along with this, it has a display hold mode, which can display the previous reading for you, while you perform the next test. In this field, timing holds utmost importance to find the immediate problem. But your old multitester may not even detect it even after being connected to the meter. So, what will you do then? Worry not, for Fluke 174 is specifically designed to solve this problem for you. It comes with an inbuilt meter that can record any sorts of currents. Even the display is of the best quality, with the backlight making it easy to work in areas that lack proper lighting. It also has a lifetime warranty, so do not worry about the safety of the device. If you think that it is just another Fluke multimeter, then you are wrong. It is a very unique and outstanding tool, designed to help HVAC electricians since it has all the basic features required by them. 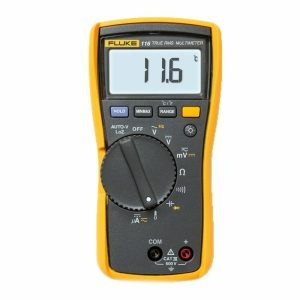 The Fluke 116 is a compact and inexpensive tool, as compared to its contemporaries. This device is laden with a wide array of features. Like, it is equipped with a thumb dial, that provides a wide range. It can easily handle all the possible scenarios of the HVAC system with ease, including the flame sensor faults. The Fluke 116 also has an auto-ranging mode by default, implying that it can automatically adjust to the best resolution for any given signal. The most outstanding feature of this device is the AutoV LoZ, which can easily differentiate between the AC and DC voltage, without giving you the hassle of switching it time and again. You can easily achieve a low input impedance on as low as 3K to omit the ghost voltages introduced by the other circuits. The Fluke 116 comes with an inbuilt thermometer that can record both Celsius and Fahrenheit readings. It has a very neat looking display that also includes a responsive bar graph. It has a backlight that brings clarity to the display resolution, making it far better than the rest of multimeters. Apart from that, it has an array of buttons that add to the functionality of this device. 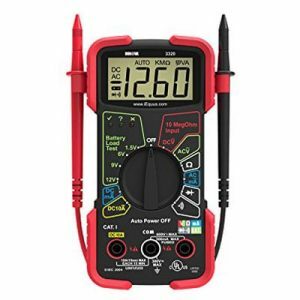 This multimeter is good for plumbing, using in cars & automotive works. It is popularly known as a stick multimeter that has auto-ranging. Mainly used by HVAC electricians, the detachable amp clamp head on it adds to the greater functionality. It can easily perform tests of all sorts, including the high-temperature analysis and micro-amps. The strong backlight makes it convenient to be used in dark and poorly lit areas. It also comes with a magnetic hanger which in inbuilt to enhance the functionality by one hand use. The True RMS can help the electrician to pick all the waveforms very accurately, whereas the bar graph has an analog mode. It makes the work very efficient and helps to note the minor changes in quick changing currents. It can be easily paired with modular accessories that help to conduct various other tests; such as manometer, refrigerant leak detector, dual temperature head, and even a combustion checker. The design of this multitester is very different from the rest. It has a PTC(Positive Temperature Coefficient) included in it which makes it a safer tool to use and protects the users. It has the category level of CAT III, ensuring safety in operations. Designed specifically for technicians and DIY electricians, it is small and comes at a low price though struggles on power circuits. 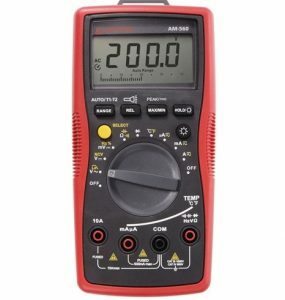 Coming at a comparatively low price, this multimeter is not as robust as the pricey ones. This multimeter is equipped with side-mounted lead holders, elastic cord hook and fold-out stand. To ensure easy handling, it also has a rear strap. It is lightweight and sleek, with the input dial centrally mounted with 13 selector stations. What catches the first attention, is the large display of this multimeter. Large and clear digits, along with color coding of different ranges surely attract many towards it. The first basic feature of Innova 3320 is the measurement AC/DC voltage. Apart from that, it can perform diode checker function, audible continuity checker and measuring resistance. The most appealing feature of this device is the auto-ranging feature, which can automatically get the correct range of any given input. Apart from the battery checker, all the settings are efficient. Auto-ranging makes the work much easier, even though you have to select the DC, AC and the milliamp ranges manually. Due to the circuit board of this device which makes full use of prime spec electrical components, this meter works exponentially fast when reading current and resistance. The Innova 3320 has a resistance of 20M, while the input impedance lies at a high of 10M. The voltage is recorded at 600V, giving efficient output. It comes with three jack sockets: the common, main terminal, and DC 10A. Also has an auto power-off after an idle time of 15 minutes. The circuit board is put together quite well, and the components are of utmost good quality. As per the price range, the reaction time is commendable. It’s suitable for students, apprentices & for repairing computers. Being such a multi-utility device, it is pretty normal to have a plethora of variants available in the market. There are so many companies producing it, and each has many models of multimeters. The excess of options may make it a confusing task to pick the right one. Worry not, for we have compiled a guide that can help you choose a multimeter. Remember almost all fluke multimeters provide audible continuity . These are general purpose multimeters and doesn’t provide data logging. It’s given that specifications are the first and foremost point of consideration. Specification here implies the capability of the multimeter, in terms of resistance, current, and voltage, both AC/DC. Keep in mind that using a multimeter above its normal current range can lead to serious damage. Most of the multimeters can work on high voltage. Accuracy is of utmost importance when you are dealing with electric currents. One wrong reading can put you and the surroundings to risk. Therefore, it is always better to opt for one that has accuracy and depicts precise results, without any ghost readings. In simpler terms, the resolution is the extent of digits up to which the signal strength is measured. It can be measured with the change in output signals, due to the minor fluctuations in input signals. 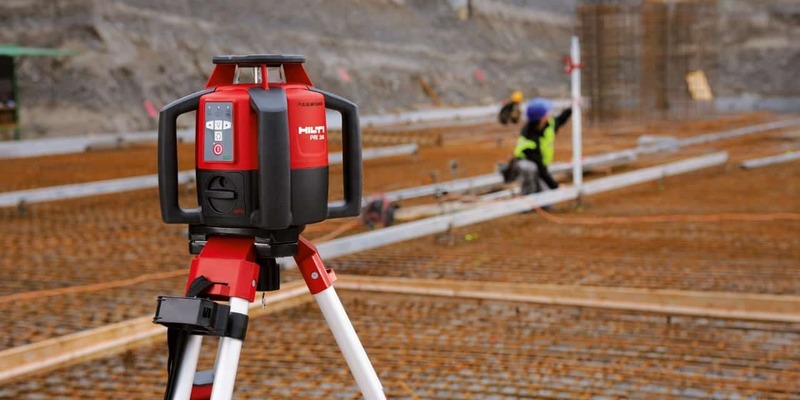 Therefore, it is better to go for multimeters with higher resolution, although it might make the device a little slow. For higher results, one must go for a multimeter with high input impedance. It will not only give you accurate results but will also help to measure sensitive electronic equipment. Multimeters are capable of not just measuring the frequency but also in monitoring the voltage and current that lies within the range of frequency. It is essential to have and maintain the correct frequency when the multimeter is powered by a steady AC voltage. Before making the buying decision, it is important to be sure of the energy capacity that the multimeter can tolerate. To avoid any damage, one must always match the energy capacity of the circuit with that of the multimeter than are thinking of buying. If you need this device constantly for monitoring the temperature, it is better to go with one that has a dual and differential measurement of temperature. This will make it easy for you to record temperature in both the formats, namely Celsius and Fahrenheit, at the same time. Which is the best multimeter that can be used in a demanding environment? With a non-contact voltage detection and Loz/AutoV function to prevent a false reading Fluke 117 Electricians, True RMS Multimeter is the best to be used in a demanding environment. Which is the most advanced digital multimeter? If you’re looking for an auto-testing multi tester that performs diode and audible continuity tests, then the Amprobe AM-560 is the most advanced digital multimeter with dual thermocouples. Which is the top multimeter for electricians? The electricians often use Fluke 87-V as the ideal multimeter to use in situations where accuracy is a must. Which multimeter is the best for an apprentice and a master electrician? 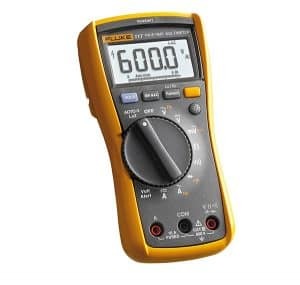 Fluke 174 multimeter is the most durable as well as the versatile option for an apprentice as well as a master electrician. What’s the most outstanding feature of Fluke 116 multimeter? AutoV LoZwhich can easily differentiate between the AC and DC voltage, without giving you the hassle of switching it time and again is the most outstanding feature of Fluke 116 multimeter. 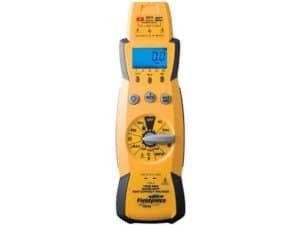 Which is the top range multimeter by Fieldpiece? The Fieldpiece HS36 is one of the best and top range meters by Fieldpiece. Which is the best multimeter for automotive and DIY electricians? Innova 3320 multimeter is the best choice of automotive use. A multimeter is called so for it is a multi-utility device that can help in catering to many problems. It can help solve many basic day-to-day problems, as well as advanced troubleshooting. Electricians all over the world have it as their most priced device, due to the plenty of uses. Well, if you are one such electrician, looking forward to buying this magic device, fret not. You are making the right choice of investing in it for it is surely going to be blessing in disguise for you. So, what are you waiting for, go today to buy it itself and make your work easy and efficient?